In a fairly rare twist of meteorological serendipity, we had three glorious days of good weather aligned perfectly with the three days that I had to spend recreationally, which is diametrically opposed to the normal pattern which finds me observing good weather wistfully from behind the obstructing layer of an office window. We started with an early morning flight down south to Portsmouth where we would have breakfast with the father/son Jackson Two. (1) From there, we would come north as far as Circleville (2), where we would buy gas. That leg would also keep us clear of the Brush Creek MOA for the next leg. From Circleville, we would head to the west to visit my parents (3), and from there backtrack to the east to return home (4). Egg flew the first leg, but there wasn't much for her to do. The air was glass smooth, so she really only had to concentrate on tracking the GPS and maintaining altitude, neither of which is particularly challenging for her - she's been able to do that since early childhood. It's time to start weaning her off of the panel as her sole means of reference, though. Breakfast was at the Skyline Restaurant, which is actually a diner located right on the Portsmouth airport rather than one of the more enticing but far less apt for breakfast Skyline Chili franchises that are common in southwest Ohio. Since Egg was buying, I splurged ($7.95) on the steak and eggs. I always get a kick out of them asking how I want the steak cooked, because no matter what I say it comes out two levels above well done. Still tasty, though, but more than a little chewy. The flight back north to Circleville was a good opportunity to exercise the autopilot. I like to use it now and again to make sure that it's working. The Traffic Information Service (TIS) came in handy when it reported an airplane coming right at us at only a 200' altitude differential. This proved a good example to demonstrate the difference between Nav hold and Track hold. 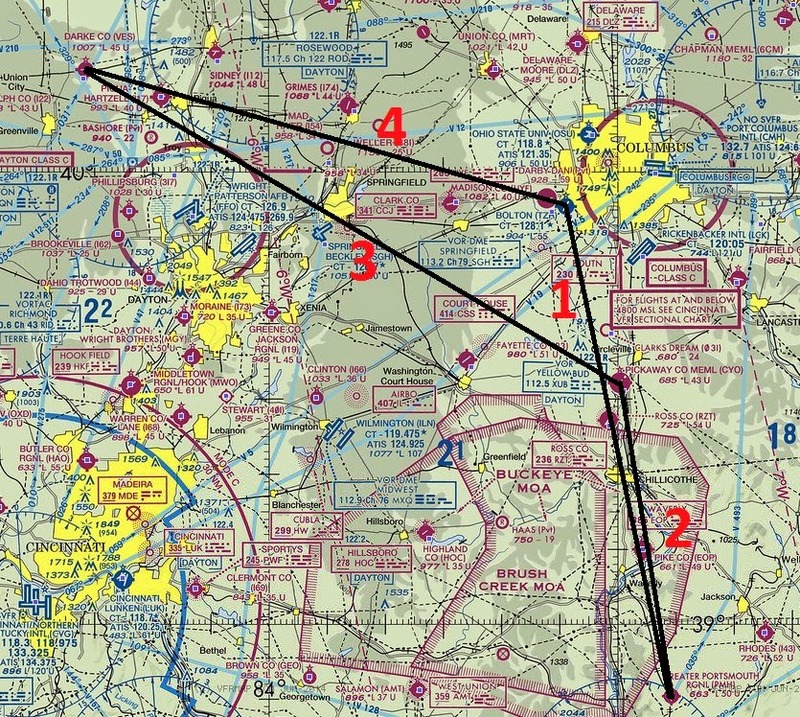 Nav hold would have kept us centered on the purple line that showed a direct course from Portsmouth to Circleville. Track hold just goes wherever I put the light blue marker (called a 'bug' in the parlance) that you can see on the right side of the screen, up at the top just under the '011' in the magenta box. I just dialed in a 15 degree offset to provide spacing from the oncoming traffic. The long leg from Circleville to Darke Co. - Versailles was also an autopilot leg. Egg was feeling a tetch queasy in the belly and the ride was getting a little rough at the lower altitudes, so we climbed up to the smooth air at 6,500'. That was also high enough to keep us clear of the controlled airspace around Dayton. It was a nice ride, but there's no Netflix on the Dynon (yet - I have high hopes for version 15 firmware) so the co-pilot amused herself by seeing how much of the world the Dynon knows about. The answer is "a lot!" We were only 5,656 miles from Japan! We flew over Springfield-Beckley which is where I did my tuition-paying six years in the Ohio Air National Guard after I had finished my five years in the active duty Air Force. Back then they had a squadron of A-7s, which were eventually replaced by F-16s. To all appearances, they seem to now have a squadron of nothing at all. Another fine use for the 'Track' mode on the autopilot - this time we offset our arrival at KVES to put us in position for a left downwind to runway 9. The winds were picking up a bit, so I tried out my new tiedown straps. They're miles too long - I'm going to have to cut off some of the excess strap, or get some kind of Velcro wrapping straps. We brought our small airplane-sized fishing gear, but I hadn't had a chance to stop anywhere for live bait. We compromised and picked up a little can of meat that is so atrociously smelly that it's more than a little surprising to learn that it actually isn't bait, and/or cat food. It ultimately proved to be useless as bait - it wouldn't stay on the hook. She ended up using the "bait" as bait for better bait - she dumped out the sausages and used the can for digging up worms. Must have learned survival skills from Lost or Walking Dead or something - damn sure didn't learn it from me! I want fish, I go to Long John Silvers. When we got back to the airport for the flight home, we found winds that were far in excess of forecast: 9 gusting 20, out of the south. This was bad news in a number of ways, but the two primary causes of concern were the direction and the relatively large difference between the constant state wind speed and the gust speed. The direction was bad because winds from the south get all roiled up by the stands of trees on the south side of the east-west runway. The large-ish variance in the constant/gust wind strength means that when the gusts hit, it's like a linebacker blind tackling you from the side. The takeoff in those conditions was, in a word, crappy. Early in the roll on the runway 27 departure, the turbulent air tumbling over the trees gave me fits in trying to find the right about of brake pressure needed on the right side brake to counteract the left turning tendency brought on by the wind. We ended up drifting pretty significantly left of the center line. Then, just as we were reaching the speed where I could transition to steering with the rudder, we cleared the trees and got blindsided by a strong gust. That drove us even further to the left. I plopped in a big steaming mess of right rudder, but by that time the wing was starting to carry enough of the weight of the airplane that the tires had very little grip. That caused quite a bit of sliding, which tires being tires, came with a healthy dose of squealing, matched in frequency and intensity by the co-pilot. Just after that, I got the plane into the air, hoping that I would have more control in pure flight mode than in the grey area of almost flying, still "driving." That would have worked out better if we hadn't also simultaneously hit a little downdraft that pushed us down the two or three inches of vertical separation from the pavement that we had achieved, right back onto the runway. The tires resumed their squawling, but at an even louder, more obnoxious level. Not for long, though, as two bounces were enough to launch us back into the ever more forgiving air. We flew back to the east at 4,500' where there was still some chop, but nothing untoward. By the time we got back to Bolton, the winds were back down to a more manageable eight or nine knots. It was still a bit of work to land, but nothing unusual. With a little more Fathers Day remaining in the bank, I then did what ground-bound dads do: turned on the U.S. Open, and took a nap.